Vegetation Structure-- Desert Riparian habitats are characterized as dense groves of low, shrublike trees or tall shrubs to woodlands of small to medium-sized trees. These habitats are found adjacent to permanent surface water, such as streams and springs. Usually an abrupt transition occurs between this and adjacent shorter and more open desert habitats. Riparian vegetation height depends on constituent plant species, willow thickets range from 1 to 3 m (3 to 10 ft) in height whereas Fremont cottonwoods may exceed 24 m (80 ft). Composition-- Dominant canopy species of Desert Riparian habitats vary. Overstory species include tamarisk, velvet ash, mesquite, screwbean mesquite, Fremont cottonwood, and willows such as Gooding, Hinds, and arroyo. The subcanopy includes smaller individuals of the canopy species as well as quailbush, Mojave seablight, desert lavender, seep willow, and arrowweed. 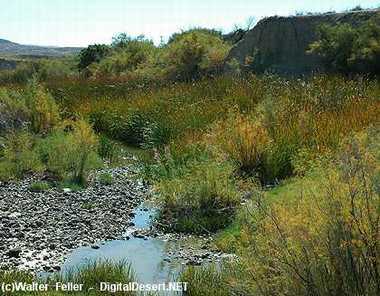 Desert Riparian habitats may exist as a variety of habitat stages ranging from seedlings through tree/shrub to large tree. Canopy development and plant density depend on available water, plant species, and site characteristics. 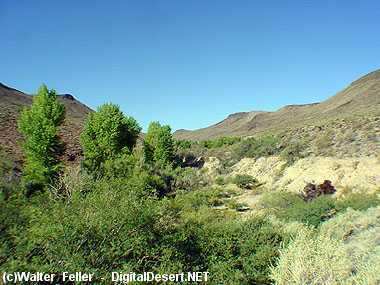 The taller, denser Desert Riparian habitats usually have an abrupt interface with most shrubby, sparse desert habitats. The importance of these relatively rare desert riparian systems to wildlife populations cannot be overstated. These habitats support more bird species at greater densities than other desert habitats, with the possible exception of some Palm Oasis habitats. The dense shrubbery and permanent water provide food, cover, and water for additional wildlife diversity. Soils vary from silty alluvial to rocky, sandy, well-drained substrates. Soils generally are moist, but some are dryat the surface with moisture beginning at a depth of several meters. Desert Riparian habitats do not persist on saline soils, but are usually adjacent to permanent streams in canyons or on alluvial deposits in wider valleys. These habitats may be associated with a variety of topographic features wherever the water table reaches the surface. 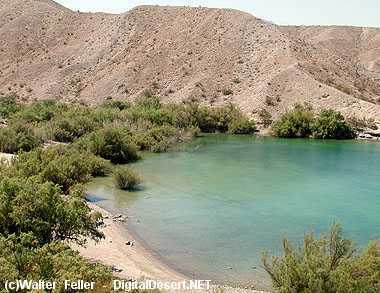 Hot, dry summers and cool to cold, moist winters are characteristic of Desert Riparian habitats. Highest July temperatures range from 30 to 42 C (86 to 107 F). Lowest January temperatures range between 7 and 6 C (19 and 42 F) (Rowlands et al. 1982, P. G. Rowlands pers. comm.). Most precipitation is in winter, but summer rainfall occurs. Total precipitation ranges from 8 to 25 cm (3.1 to 9.8 in) per year and potential evapotranspiration is 3 to 17 times as great as precipitation. 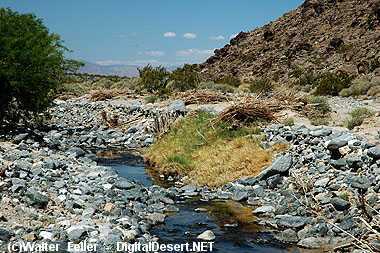 Desert Riparian habitats are found along permanent streams and at seeps and springs in the Mojave and Sonoran deserts. These habitats generally are found at elevations less than 900 m (3000 ft); however, willow thickets may be found well above that level in mountains.